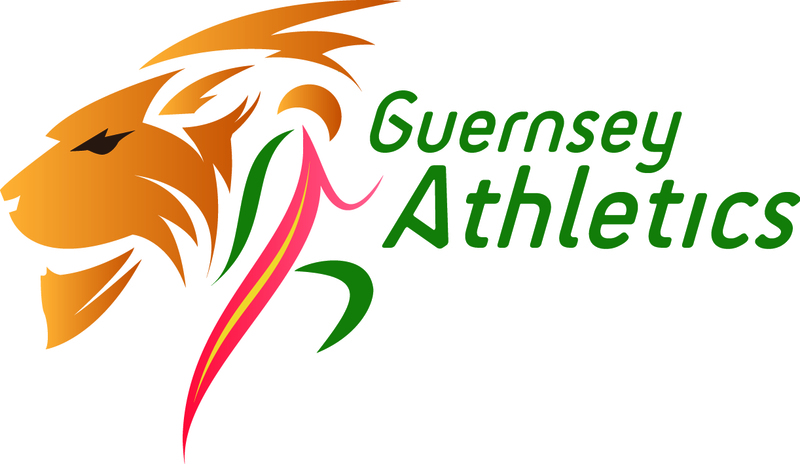 The IAAF Points tables allow comparison of performances across events and have been used for several years now by the GIAAC as a measure of how Guernsey’s top 15 athletes compare against each other and also to previous years. Only the best performance by each athlete is listed. Further explanatory notes are given at bottom of text. After a plethora of championship medals earlier in the year Cameron achieved his season’s goal by making selection to the IAAF World Junior Championships as GB’s only 400m representative. His semi-final run of 46.51 seconds was the fastest run by a European teenager in 2016 and he only narrowly failed to make the Bydgoszcz final. Acheiving the highest IAAF pts score for a Guernsey athlete in 2016 he becomes one of only a handful of Guernsey athletes in history to score beyond 1000pts. Lee’s first major international vest was in 2008 and 8 years later he gained another courtesy of his 2:16:42 run in April’s Virgin London Marathon which ultimately got him selected for GB’s European Champs team. Lee also broke the island half marathon record a month earlier in New York. Nat had a quiet 2016 but hit a purple patch in late July and Early August. Her best run gained 8th in a close but competitive AAA / Inter-Counties final. Although outside her best over 800m she also ran quickly over 3000m before finishing her season early. Out with injury for much of 2015 15 yr old Sophie returned and made massive improvements in 2016. She ran a personal best to make the English Schools U17g 300m final and then went quicker in the final itself for an excellent 5th place in an outright Guernsey Women’s record. Arguably she went better in winning bronze in August’s England U17 championships but that was over the age group specification 300mHurdles event. Sarah had a disrupted summer season and her best performance of the year came in Easter’s 10k road race in far from ideal conditions. 19 year old Sam Wallbridge was outside his peak long hurdles form of 2015 but ran consistently around the 55 second mark and was rewarded with medals at county, regional and national level. His best run secured the Gold Medal at the Under 20 Southern area Championships in June. Alastair Chalmers suffers as his better 400m Hurdle events were over lower U17 age specification hurdles so have to be omitted(no scoring tables exist). If included against the senior tables he would score 989 points. Ala did not race over senior height during 2016, included however is his best flat 400m performance. The 300m & 2000SC are included as they were raced over senior specification & tables exist. Although Kylie Robilliard only raced sparingly early in the year she did post a fast indoor 60m time but no outdoor tables exist for this event. The 2014 Outdoor version of the tables were used for this comparison. The tables are “absolute” and score against senior standards there is no age grading. 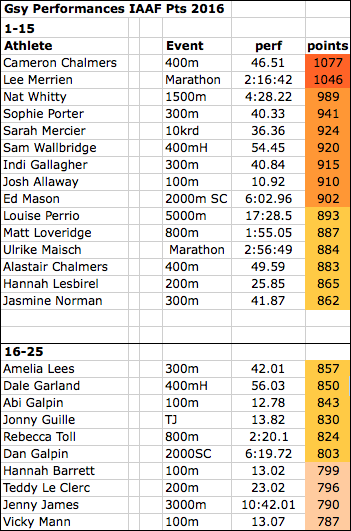 Junior athletes are included where their performance in a senior specification event scores sufficiently. However there is some evidence that events that are popular at junior level with proportionately lower senior participation are scored more generously.